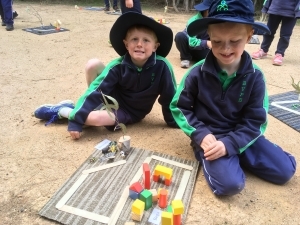 ‘People live in places’ is a geography program designed especially for Early Stage 1 students. 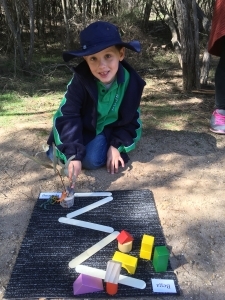 It is designed to encourage students to explore Bournda National Park and to learn why it is a special place. Through this understanding students will discover why it is so important that we look after special places like National Parks. Students will also explore maps of their local area, including Bournda, and create maps of their own to help their understanding of how locations of places can be represented. How can we look after the places we live in? The students are introduced to the topic of what things make the bush a special place by sharing the short text ‘The Bushwalk’. Students then go on a short nature walk to observe and discover some of the special plants and animals at Bournda. Students work in pairs to record the things they find on a visual check sheet. Once down by the lake the students take part in a role play activity where they are the National Park Ranger who has to look after Bournda. Through this activity students gain an understanding of why we need to look after this special place. At the end of the session students create their own ‘magic spot’ by the lake and think and share about a place that is special to them. Students are shown large maps of the area in which they live and are asked to share where they live. They record this information as a class on a large tally chart. Smaller maps of Bournda are examined and discussed, focusing on the main parts of a map (road as a line, buildings as a dot or square). The class then creates a large map of the town where they go to school by choosing items such as a rope to represent a road. Students then work in pairs to make their own maps of the road from their town to Bournda. 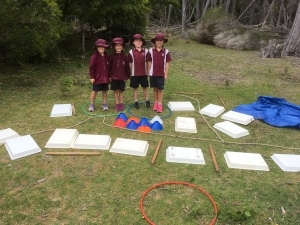 At the end of the session students play a running game where they have to hunt for parts of Australia in the bush and as a class help create the map of Australia from the puzzle pieces. Environmental games are fun, sensory based activities that students can play at the end of the day. BEEC has a selection of these games that can be chosen to suit your needs.